Matt Mullenweg announced on Monday, December 3, 2018, that the latest target release date for WordPress 5.0 is Thursday, December 6, 2018. 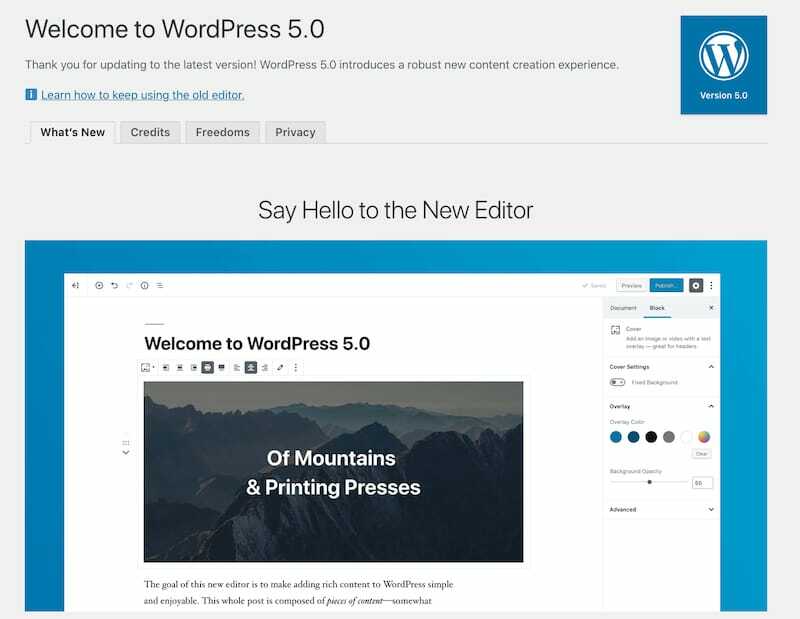 This major upgrade to the WordPress platform features the new Gutenberg block editor which will dramatically change how content is created and published on WordPress-based sites. This announcement was a surprise to the WordPress development community based on earlier guidance that the release would be in January. The Publishr.cloud team has been preparing for this release for several months. We have been testing our WordPress-based products like Publishr Author, our underlying frameworks, standard themes and plugins, and custom sites we have developed for customers. Our team has also been developing new “best practice” recommendations for upgrading to 5.0, staying with the Classic Editor, and for block-based development with the new Gutenberg editor. We always recommend checking updates in both your local development and staging environment before live deployment. This is especially important since themes and plugins may also need changes to be compatible with 5.0. We recommend checking the “5.0 status” of all third party themes and plugins you are using and verifying all of the functionality of your site is working with 5.0 on your staging site. If you don’t have a staging environment, it is probably the time to bite the bullet and deploy one. If parts of your site do not work with the new Gutenberg editor or you just haven’t had a chance to learn enough to use it yet, you can install and activate the Classic Editor plugin. Make sure to do this BEFORE upgrading to 5.0. We usually recommend that clients update to new WordPress core, theme and plugin versions as soon as they are available. Given the significant changes WordPress 5.0 includes, we are recommending a more conservative approach for this upgrade cycle. We would recommend deploying 5.0 on your staging site once it is released tomorrow. Then wait for the first official point release (5.1) which is expected in January. Use the time to test and get familiar with how to use the new editor on your staging site. If you create content with the classic editor, Gutenberg will provide significant new capabilities to help you create compelling content. We are already seeing the development of block libraries. If you use a page builder, you need to review their strategy for working with Gutenberg. We expect lots of exciting developments once 5.0 is officially launched. Need help with your WordPress 5.0 Upgrade? Get in touch with us today and let’s talk about how we can help.